Skin cancer: the words conjure up scorching sun-damaging skin cells. But the sun is not the only culprit when it comes to this form of cancer. Here are six other risk factors to keep in mind. Tanning beds have become very popular lately. Young and old alike are opting to “bronze” their skin with ultraviolet emitting devices like tanning beds and lamps. But these beds are not any more safe then spending hours in the sun. In fact, the World Health Organization added these devices to their list of the most dangerous sources of cancer-causing radiation. This list contains some heavy-hitters in the world of hazardous substances, including the sun (the biggest risk factor for skin cancer), radium, and plutonium. 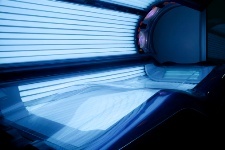 Tanning beds pose a particular risk for those who are young. If someone uses a sunbed before the age of 30, for example, they increase their risk for the deadliest form of skin cancer by an alarming 75%. People who use tanning beds are also more likely to develop two other types of skin cancer: squamous cell carcinoma (increases your risk 2.5 times) and basal cell carcinoma (increases your risk 1.5 times). Germany has banned indoor tanning for those under the age of 18. Most of us don’t think to put sunscreen on before getting into the car. The truth is, your left side can be exposed to direct sunlight for two or three hours every day by the time you’ve negotiated traffic and done all the errands you need to do. Research shows that skin cancer is more common on the left side of the body in North America and on the right side in Europe. Driving a convertible poses additional risks for your skin. Those with Parkinson’s need to be extra careful in the sun. Studies show that there’s an increased risk for skin cancer in those with the condition. Researchers think there may be a link between the genes that cause Parkinson’s and those that cause skin cancer. Smokers are at greater risk for skin cancer. This is likely due to a weakened immune system and greater exposure to chemicals. People who have had an organ transplant have as much as a 200 times greater risk for getting skin cancer. For those who have a donated organ, it’s necessary to get screened for skin cancer regularly—sometimes as often as every month. Medications taken to lower the risk for rejection of the new organ, unfortunately, also lower the defenses of the immune system, making skin cancer a much more likely threat. If you’ve undergone radiation therapy for any other types of cancer, you need to take extra care to protect your skin from sun exposure. In general, remember to use sunscreen. Try not to spend a great deal of time outside, under direct sunlight during the midday. This is when the sun is at its most dangerous as far as your skin is concerned. And finally, consider covering up with SPF clothing. Schulman, J.M., et al., “Indoor ultraviolet tanning and skin cancer: health risks and opportunities,” Curr Opin Oncol. March 2009; 21(2): 144-9. Bertoni, J.M., et al., “Increased melanoma risk in Parkinson disease: a prospective clinicopathological study,” Arch Neurol. March 2010; 67(3): 347-52. Togsverd, B.K., et al., “Organ transplant recipients need intensive control and treatment of skin cancer,” Ugeskr Laeger. May 13, 2013; 175(20): 1408-1411. “Tanning Beds: WHO Issues Official Warning,” Skin Cancer Foundation web site; www.skincancer.org, last accessed June 26, 2013.